The native residents of Hopkins, mainly Garifuna, lived a life unruffled by world affairs but unaided by modern day technology.. There was no organized garbage pick-up; rather garbage was burnt in family burn-pits which might have worked in days past before plastic bottles, canned foods and plastic diapers. There was a town generator but the only thing predictable about it was that it was un-predictable and therefore could not to be relied upon. Hydro was problematic from day to day. The road in and out was remarkably unpaved and incredibly rocky. Ditto the main road tying north Hopkins to south and forget about the roads or paths that lead to the shanties to the west. Yet it was a fascinating village, then and now, a place where you could and can relax and enjoy the sun, sea and sand without distractions. 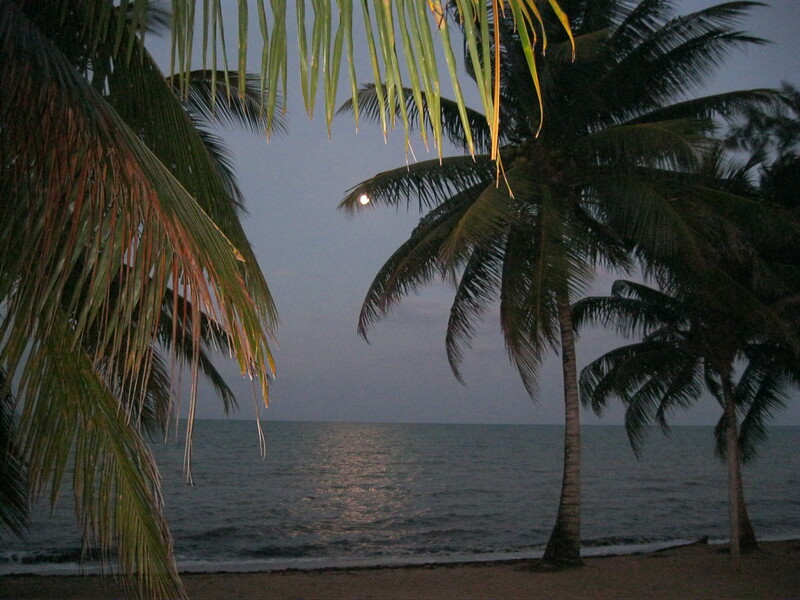 Hopkins Village has a settled population of 1,000, made up of Garifuna , a mixture of West African slaves and Carib Indians, and Mayan and Creole, a burgeoning Chinese presence, and an increasing number of ex-pats from Canada, the U.S., and England who have chosen to live in Belize full-time. 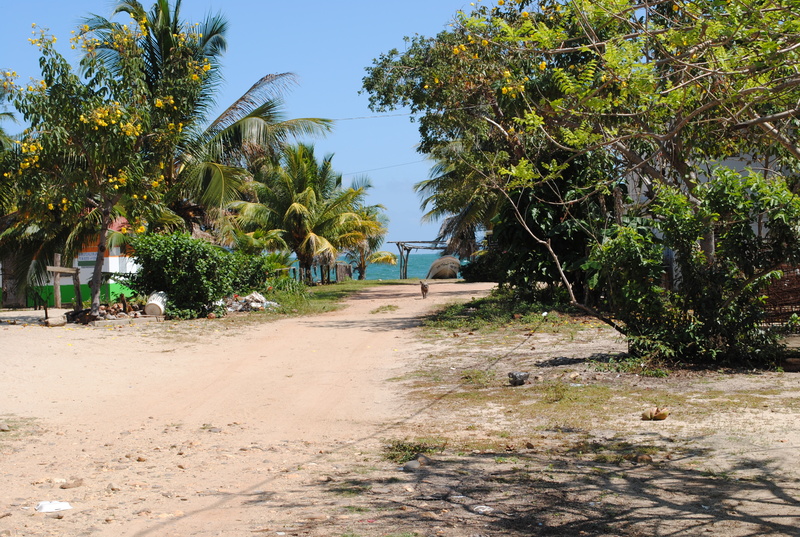 The village runs down the coast along the sea and the majority of the small hotels, inns and guest houses are within sight and earshot of the Caribbean. Palm trees line the beach. As I mentioned earlier, Hopkins Village has one of the best beaches in Belize because boats are not allowed to dock off shore. Unlike San Pedro and Caye Caulker which allow docks for boats, all boats in Hopkins must drag their boats ashore, thus creating an uncluttered shore line. It is a great place to take a walk along the shoreline, skipping over the incoming tide. Or a great place to settle into a lounge chair with a good book, periodically getting up to run into the sea to cool off. Over the 14+ years we’ve been visiting Hopkins Village, we’ve seen impressive improvements. The road from the Southern Highway (4 miles) hasn’t changed much, though the town roads are better . There is regular garbage pick-up, the lights are on in the houses, street lights illuminate the main road from north to south and the town water supply is reliable and potable, though we drink bottled water everywhere we travel in Belize, mainly to intake the same water from town to town and not challenge the belly with change. The times they are changin’, mostly for the best, I’d say, but it’s not the quiet little village it was when we first went there, and in 10 years I expect Hopkins Village to be very different, not necessarily better or worse, but different from what it is now. I’m glad we got to know it when we did but we like it the way it is now with a little more verve than it had before. 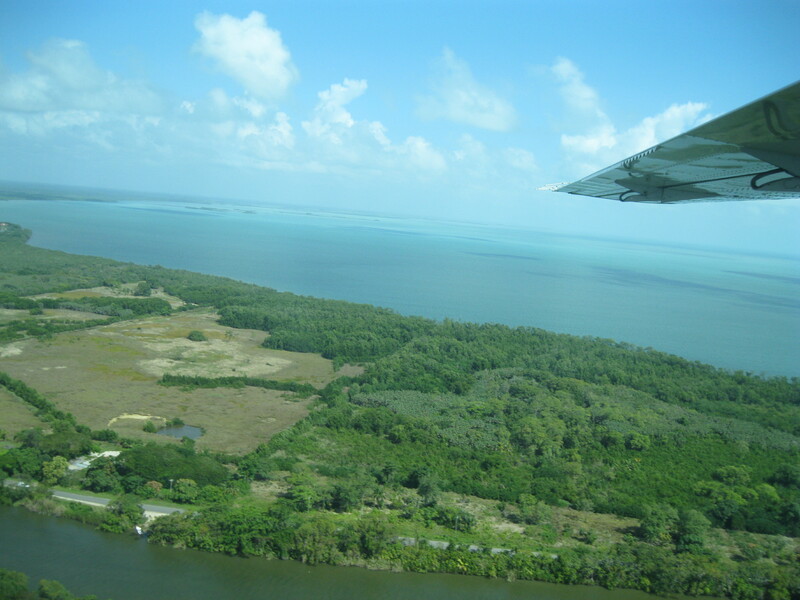 Let’s start when you land at the Goldson International Airport, about 15 miles north of Belize City. Wait for your luggage and line up at Customs. This could take ½ an hour or more. Check out the Duty Free shop before you clear Customs. Usually some good deals on wine and booze Now what? 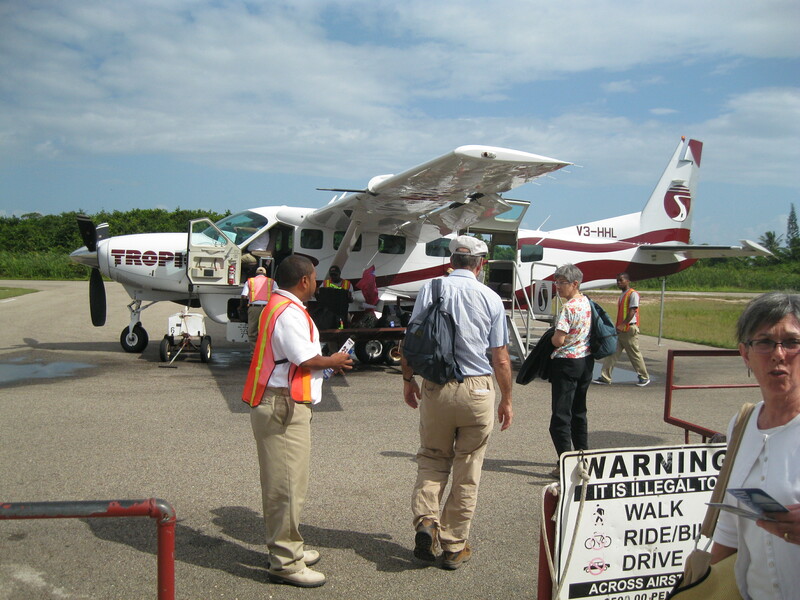 First, you can fly to Dangriga on either Tropic Air or Maya Island Airline. 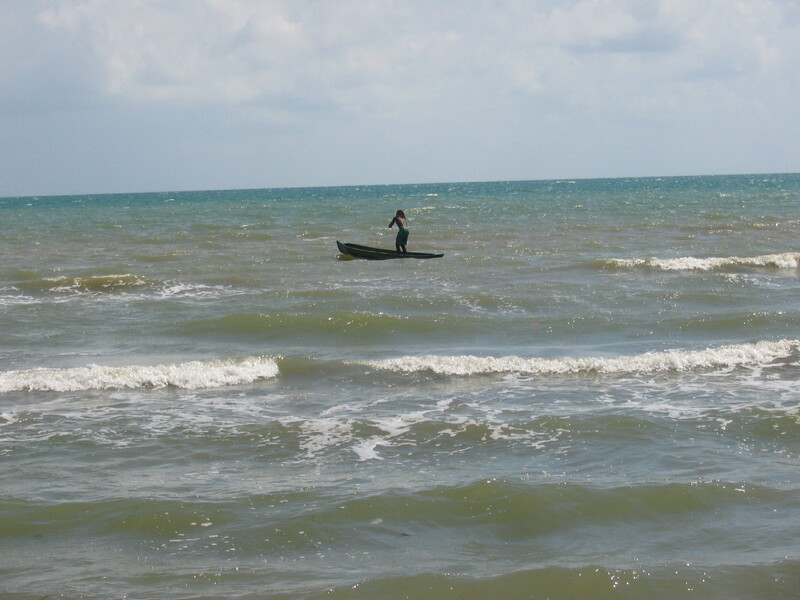 Dangriga is a large village a short distance from Hopkins Village. Make sure when you book that you stipulate you want to fly out of the International Airport and the not the nearby Municipal Airport. It will cost about $80 usd per person. 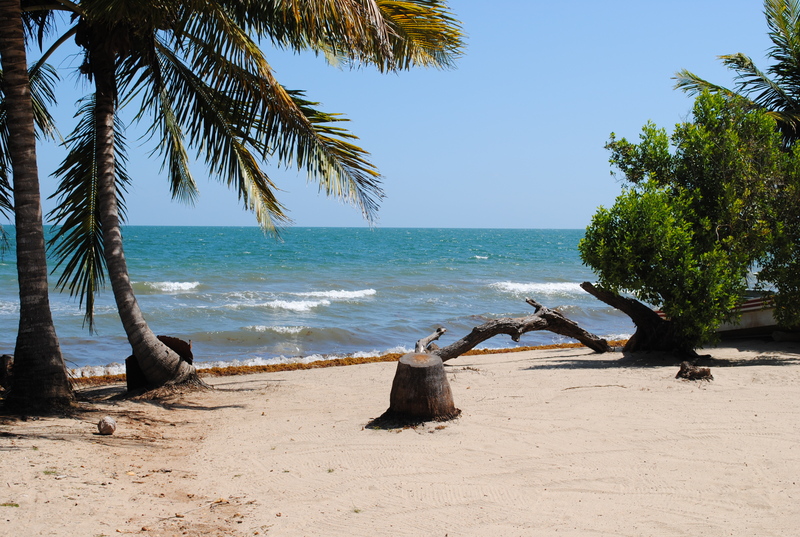 If you have pre-arranged with your host in Hopkins, someone will be in Dangriga to pick you up. Ask how much. Your flight from the International Airport to Dangriga should take 20 minutes. After pick up, you could be in Hopkins in ½ an hour. By far the fastest from point A to point B. Or you can contact Tosh Lanza who operates a shuttle service out of San Ignacio. She can pick you up at the Airport and take you on a ride down the Hummingbird Highway for about the same amount as as the plane. It will take longer but it will be more exciting. You can contact Tosh at http://www.cayoshuttle.com. She will let you know how much it will cost but it will be in the area of $150 usd for two, $25 for each additional person. Alternatively, you can take an Airport taxi to the Main Bus Station in Belize City. Fixed fare is $25usd or more for two. Once there, take a bus to Dangriga. About $10 usd each. * The bus will take the Western Highway to Belmopan, the capital of Belize. From there you will travel on the Hummingbird Highway through the Mayan Mountains on a Blue Bird school bus, arriving in Dangriga about 2 and ½ hours later. Once again, make sure you have pre-arranged to have someone pick you up at the bus station. *Fares are collected on the bus after departure. Every bus has a driver and a mate. The driver drives and the mate helps load the bus and collects the fare.Make sure you have some small bills and loose change on you. If you miss the last bus from Dangriga to Hopkins Village and haven’t arranged to be picked up, take a taxi from the bus station to the Chaleanor Hotel (www.chaleanorhotel.com in Dangriga. Ask the owner/manager Chad Usher to give you a room. Chad is one of the best guys in the hotel business and his son Chadwick is following in his dad’s footsteps. If they don’t haves a room available, they will make sure you get one elsewhere, and they will tell you when and where to catch the first bus to Hopkins in the morning. If you land late in the afternoon, you might not make the last flight to Dangriga, though you might still be able get to Belize City and catch a late bus. (The small propeller planes can’t fly after dusk and it starts getting dark before 6 p.m.) You now have another option. Take the Airport Taxi to a hotel in the City and stay overnight. The Bakadeer Inn, Belcove Hotel and Conningsby Inn on Regent Street are quite close to the main downtown Bus Station. Buses leave from the station on a regular basis. If you leave early in the morning, you should get to Dangriga by 11. Check with the desk clerk at your hotel and find out if you can get an express bus out. As with the other hotels and resorts I have featured in my earlier blogs, I unreservedly recommend Hopkins Inn. It’s a perfect place in a perfect spot of the world for a laid-back, relaxed, don’t worry vacation. Of course, I exaggerate to make my point. There ain’t no perfect that I know of, except maybe the pluperfect. 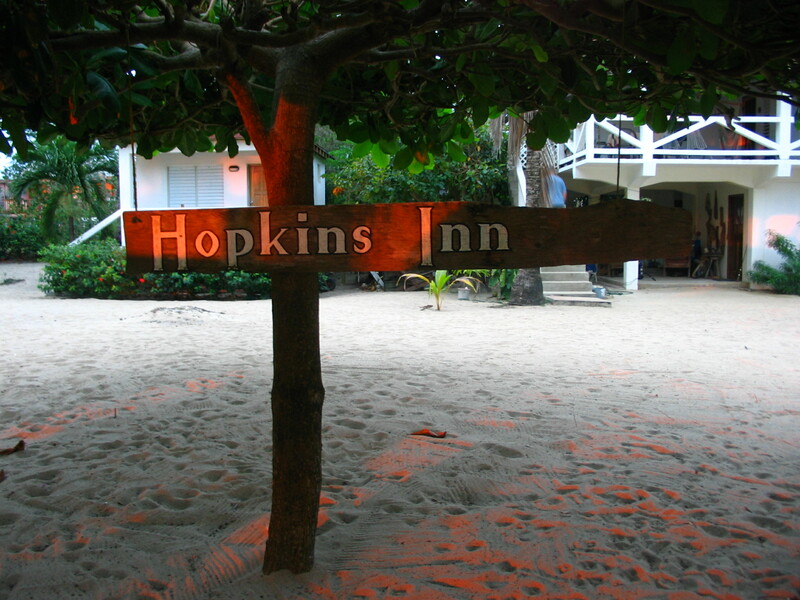 What I am saying is, without exaggeration, we visited Hopkins Village on our first visit to Belize in 2000, stayed at Hopkins Inn, and have returned almost every year since. That’s why I’m a blogger, not a travel writer hired to check out hotels and restaurants. I am a traveller travelling on a budget and when I see a good thing I stick with it.In most places we have visited, Belize City, San Ignacio, Caye Caulker and Placencia, we did try different hotels before we settled on our favourite. In Hopkins Village, we found our favourite on the first try, except for once when we didn’t make reservations on time but were lucky enough to find another place that suited us. Greg and Rita own and manage Hopkins Inn. 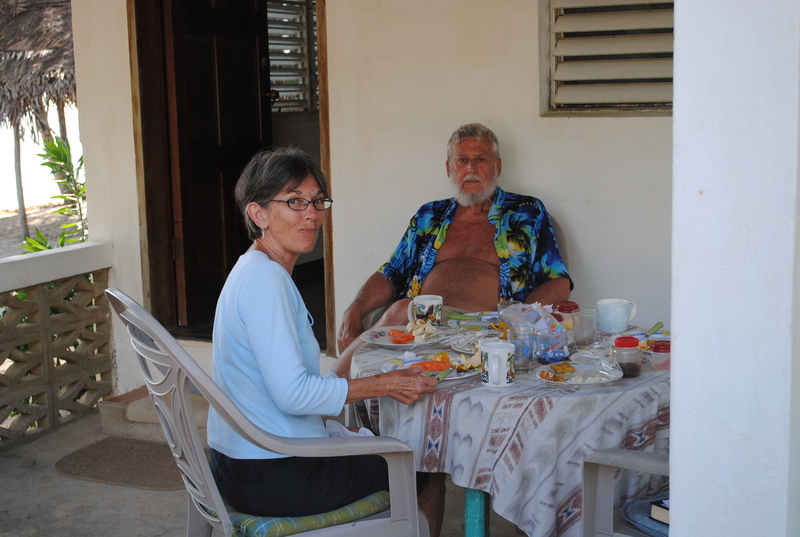 Greg is a Texas-born American who made his living in Alaska and is now a Belizean. Rita is a German married to an American-Belizean. They both call Belize home now, the fulfillment of a dream they shared and turned into a reality. Like the others I have introduced to you (Shalue at the Aguada in San Ignacio, Cyndi and Orlando at the Hotel de la Fuente in Orange Walk, Luciana and Michael at the Oasi on Caye Caulker,) Greg and Rita are great hosts. They will go out of their way to ensure you have a safe and happy vacation.. They built the Inn from scratch, one cabana at a time on a large palm-tree strewn compound. There are now four finished cabanas for rent plus a cabana for Rita and Greg to live in. The Inn’s foremost to the sea cabanas are roughly 20 feet from the Caribbean and the other two are set back only a little. (See pics) The two rear cabanas are a little smaller than the front two which vary somewhat in detail. All the cabanas have a bar fridge and a coffee maker with coffee provided. All the cabanas have verandahs, too, where you can enjoy a sun-downer and enjoy a cake or cookie or piece of pizza maybe even prepared by locals and sold to you by their children. Greg makes sure the compound is raked regularly and the shoreline cleared of unwanted debris. 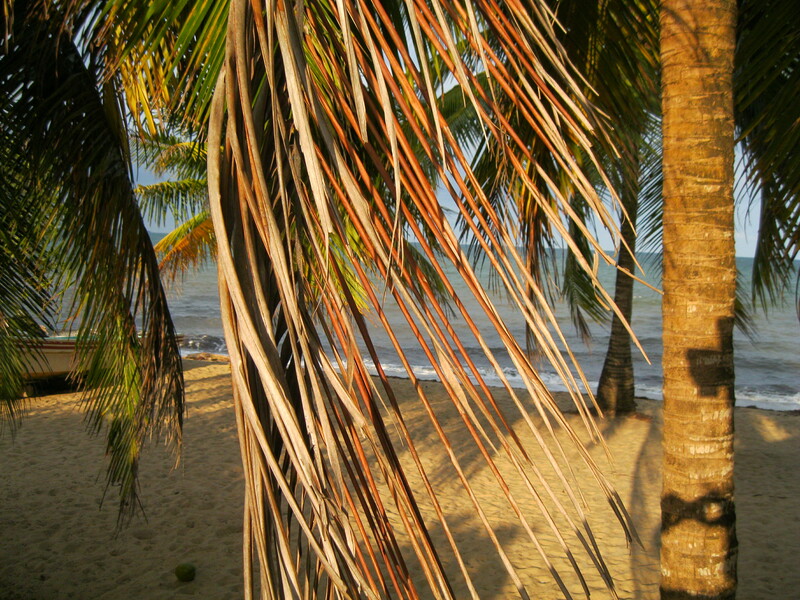 Near the shore, there is a covey of palm trees where you can relax in a hammock in the shade of the palms with a book listening to the waves roll out or in. The swimming is good and the water warm and salty. After your swim, sit back in one of the beach chairs and let the sun dry you. In the morning, between 7 and 9, Rita will serve you a continental breakfast of local breads, fresh fruits, maybe a hard-boiled egg or some cheese, jam, and fresh orange or pineapple juice. She prepares this herself and brings it up to your cabana. Why does she do this? I’ve asked her. “It’s a chance to get to know my guests” she says, as though that wasn’t self-evident. We’ve stayed at the Tipple Tree Beya owned and managed by Patricia, a charming Englishwoman, for a week a few years ago and thoroughly enjoyed ourselves. 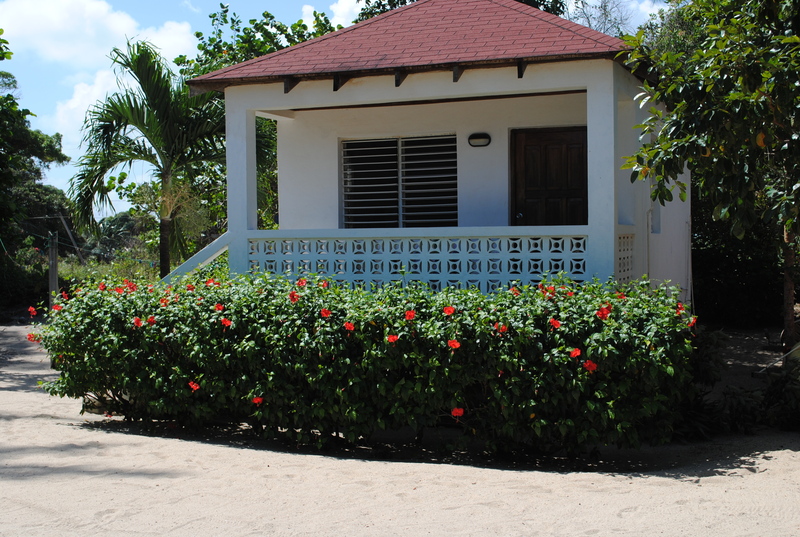 Patricia keeps the beach-front and the entire compound swept and clean. We stayed in the back cabana which reminded us of a cottage in Northern Ontario. We have heard that the All Seasons Guesthouse and the Seagull’s Nest Guesthouse will take good care of you at a reasonable price. For the younger crowd, try Oli’s Windschief Cabanas, adjoining the Beachbar and Internet Café or Funky Dodo, a youth hostel close to the intersection when you enter the Village. South of the Village, you will find three or four higher-end hotel/resorts, Hamanasi chief amongst them, a well-known scuba centre. It’s your call. You know how much you want to spend and what you expect to get for it. This entry was posted on Friday, November 30th, 2012 at 11:30 am	and posted in adventure, Travel. You can follow any responses to this entry through the RSS 2.0 feed.